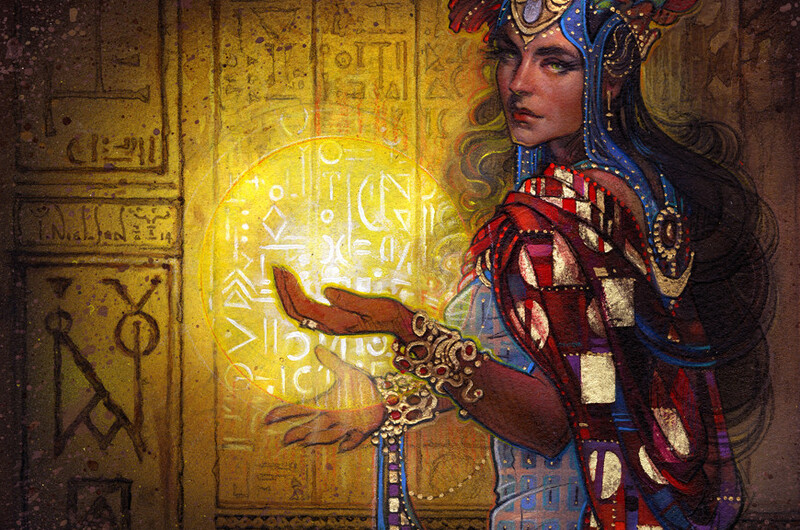 Today I’m going to take a look at the Elspeth vs. Kiora Duel Decks to see where the financial value of the decks lie. I’ll look at both the MSRP versus retail value of the singles and then present my thoughts about the future values of the cards. For the alternate art foils, I am going to use the TCG Median price since MTGPrice does not yet track the value of the duel deck foil versions. Wow, the retail value is worth more than double the MSRP of the deck. However, as we all know the retail value can be misleading. I did account for the alternate art foil version of the headlining cards rather than their regular counterparts yet why is there is such a vast difference between MSRP and individual retail value? Most likely, the market hasn’t caught up yet with the mass release of this product. Initial glances tell me that any value in the deck is going to dry up as time marches on. Before I talk about individual cards I first want to point out two things about the decks. Firstly, It is a shame that neither deck contains any relevant Modern reprints. Unlike Jace vs. Vraska, this deck didn’t give us anything amazing like Remand to make us really want to go out and purchase it. It’s mainly reprints of casual favorites, along with some other interesting choices (a gustcloak theme in the Elspeth deck? Really?) to help us along our way to acquiring a new alternate art, foil Elspeth and Kiora. I mean sure, Path to Exile has been reprinted six times already but maybe replace one of those Sun Lances with a card that has more flair? Meh, who am I to judge versus a team of WotC field research. Maybe Nimbus Swimmer, Scourge of the Fleets, and Sealock Monster are really what the target customer of this product wants. Secondly, I am actually surprised that Kiora’s deck is worth more in value on average than Elspeth’s – especially considering that Mother of Runes is almost as expensive as the Kiora foil! The surprising value comes from the playset of Accumulated Knowledge, two Lorescale Coatl’s, two Coiling Oracles, and the Inkwell Leviathan. All of these cards share the trait that they haven’t been reprinted since this duel deck (outside of premium or promo versions). Unfortunately for Elspeth, the value drops pretty hard after Mom. Decree of Justice and Captain of the Watch, the most valuable runner up cards in the deck, are barely breaking $0.50. Hardly a surprise then that Kiora would slightly eek out value over Elspeth even with such a Standard defining planeswalker heading the deck. OK, now that I’ve covered these two subjects let’s dive into the singles. Currently selling for $10 on TCGPlayer, Elspeth will continue to sit around $10 until rotation since it is such an important Standard role player. Then, the price will continue to drop sharply since Sun’s Champion doesn’t see any eternal play in Modern or beyond. Due to the duel deck reprinting, there are going to be plenty of copies of Sun’s Champion on the market which will drop the price into the $3 range. The price for entry is fine for now – she currently is worth half the MSRP value of the deck. However, be warned that that this price will not last forever and will decline fast going into Theros rotation. 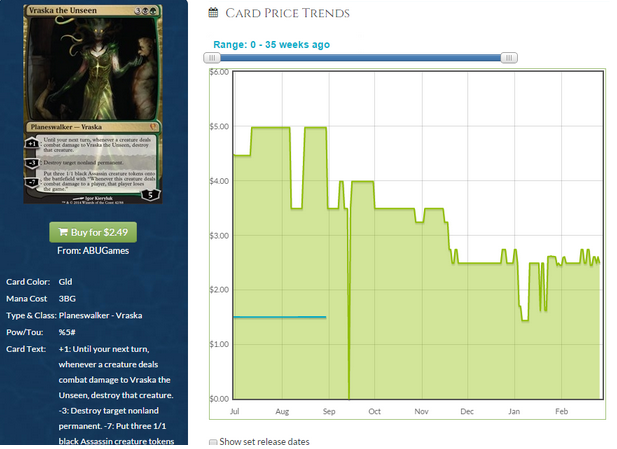 Again, Kiora’s initial price reflects the hype demand of the release of the new duel decks. Let me direct your attention to the following trends. I’m surprised that they’ve bottomed out so hard but I can see the reason why. Putting Remand, a certified Modern staple, in the product will do that to the other cards. Since Remand is carrying the bulk of the value of JvV Duel Deck the other cards have been very suppressed. 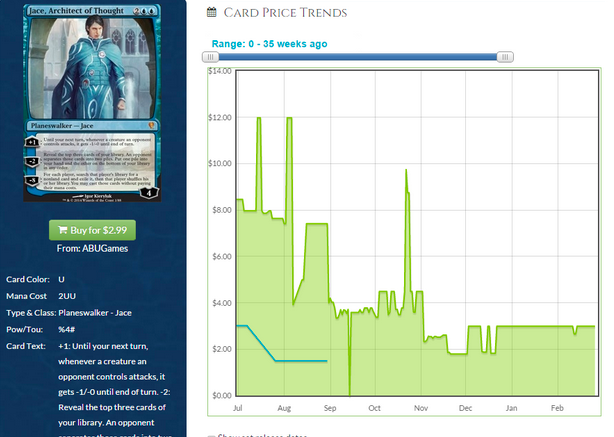 Even Future Sight, a card that at one point was $4, is now only a measly $0.57 after the release of the JvV Duel Deck. Overall though, the JvV duel deck package was pretty weak overall – kind of reminds you of this duel deck package, no? Except no Modern staples. There are plenty of casual cards, however just like the rares Future Sight, Ohran Viper, and other others, I expect them to drop to around $0.50 or less eventually. Kiora will also follow the trend of Jace and Vraska. Without extensive tournament play in Modern (which seems unlikely) I fear that she will also not escape the $3 fate. Honestly, I can see this card maintaining $4-$5 long term strictly on the back of casual appeal. Mom is popular enough with casual players (and of course Legacy enthusiasts) that I can see her continuing to maintain value in the long term, especially with new art. Mom is this duel deck’s Remand, the price is going down but not by much. The card has much casual appeal, yet I will refer back to the Future Sight / Ohran Viper example. This card isn’t higher than $0.50 once these decks hit stores everywhere. Let’s take a look at Jace’s Phantasm here to see a similar example. Before the JvV Duel Deck, Phantasm was around $2.50 at it’s highest point. It is now around $1.25 even after the reprint, which is actually pretty decent since it only lost half value (at least compared to the planeswalkers above). Half value leads me to predict that Coatl’s will be around $1.50 (or slightly higher) once the EvK decks are out for a while. I don’t see this losing value. It’s already a common, and the release of the duel deck isn’t going to crash the price. The deck provides four of them, with a total value of about $2. Despite the reprint I don’t see it changing much. Again, like Accumulated Knowledge above, these cards aren’t going to be crashing overnight due to this duel deck like the rares in the deck. They are all popular casual cards that should maintain a decent amount of their value going into the future. Unfortunately, even though this deck appears to have quite a bit of potential based on the retail value of the singles right now, I can only predict doom and gloom for many of the card’s prices based on the performance of Jace vs. Vraska Duel Deck singles. The only one to come out unscathed was Remand, due to its vast Modern appeal. To this day, the card still carries the bulk of the value of the JvV duel deck. Unfortunately, the only similar card from the Elspeth vs. Kiora Duel Deck is Mother of Runes, which already has several printings. Regardless, I still think it will do well in the long run due to its vast casual appeal in addition to the added Legacy appeal. In summary, if you’re going to buy this duel deck for a collection or to add it to your existing repertoire of duel decks then please buy it for as close to (if not lower than) MSRP value as you possibly can. Even to this day, JvV duel decks can easily be purchased online for $18 including shipping. I’m sad to say that this is one of the weakest duel decks that we’ve seen financially. Speed vs. Cunning was so much stronger, which not only included Modern and Legacy playable cards but also provided copies of wedge tap lands and other great commons and uncommons that will hold value going into the future. Due to the lack of Modern appeal I can’t see this deck being a great purchase unless it is being done from a purely causal perspective. However, as a sealed product there is chance that it might be a good idea to throw a few of these into storage for several years down the line. Sealed Sorin vs. Tibalt Duel Decks are starting to see a price increase since they are becoming harder to find. Many are now $25 to $30 online. Not that this is a huge price increase for holding onto them for a few years, but it does give me a feeling of security knowing that even a planeswalker as crappy as Tibalt has a chance if he’s in a sealed product that is popular with casual players. What do you think of the new duel deck? Are you planning on buying one, and if you are what really draws you to the duel deck?